Dotster is a simplified, low-cost hosting service that is designed to meet the needs of small-sized businesses. If you are just getting your website up and are looking for ways to save money on hosting services, you may be asking the question, “Should I try Dotster web hosting?” Following is everything that you need to know about this company and the packages it provides. For a company that prides itself in providing simplified hosting solutions, Dotster offers a fairly expansive array of service options. These include VPS, Linux and Windows hosting as well as hosting for WordPress blogs. Subscribers can also choose to use their Instant Website and SimpleScripts Apps features along with the Dotster Drag and Drop Builder. 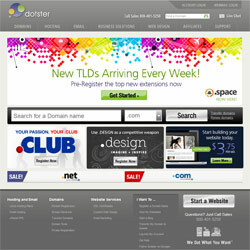 Dotster provides an Instant Website hosting plan that promises to provide a simple and ultra-rapid set-up process. Basic sites can be created within mere minutes by using the various functions that this tool provides. This combination hosting service and developer tool is perfect for personal and small business use, but not comprehensive enough for meeting the needs of medium, large-sized and rapidly expanding companies. It comes with 2GB of monthly bandwidth, a website template that is SEO-friendly, and the ability to add basic email for a comprehensive hosting solution. The Drag and Drop Builder can be included in most Dotster web hosting plans. This tool breaks the design process down into three quick steps that allow for increased customization of web pages and provides a much more comprehensive solution. Subscribers can get a free domain name and deluxe web hosting with most plans that include this resource. SimpleScript can be used to optimize any website that is built via Dotster tools. With a number of applications that are easy to install, Dotster has made it much easier for novice site designers to customize and enhance their websites for greater functionality and improved user experience. These include a new generation of apps for content management among other things. Windows hosting comes in Basic, Deluxe and Ultra, with the Deluxe package being deemed as having the highest value by Dotster itself. Although Dotster has some fairly reasonable prices for each of these three plans, they are not the absolute lowest in the industry. Bandwidth is advertised as being scalable for each option, while subscribers will get unlimited website disk space. The basic plan includes unlimited sub-domains, 10 MySQL databases, 5 FTP logins and 100 email addresses. Deluxe and Ultra subscribers get unlimited hosted domains, unlimited sub-domains and unlimited FTP logins. Unlike the Deluxe plan, however, the Ultra plan comes with unlimited email addresses. The company does supply a number of generous, but limited-time offers to new subscribers and thus, the competitive prices that are already available can be driven down a bit lower by taking advantage of these discounts. Given that Dotster is designed to be a simplified hosting solution, this company lacks many of the bells and whistles that are available through other hosting providers. The sign-up process is also consistently reported as being complex. With fewer support options than many of its larger competitors, Dotster has yet to make the sign-up and transfer process a seamless and hassle-free one. If you’re looking to save money on hosting and want guaranteed uptime and access to a number of impressive, site design features, this company could be right for you.